(Still from film trailer) Isabel Bennett plays Mia, a local sports writer who’s covering a controversy surrounding the football team at Aberdeen High School. Director Colton Van Til had most of the basic plot lines for his film set in stone, but didn’t quite know where the story should take place until he discovered Aberdeen. “What stood out for me was really the landscape. I really liked how the coast of the Pacific Northwest met with a small town like that,” he said. The film is titled “Aberdeen.” The crew only spent about a day shooting here, but landmarks such as the counterweight bridge over the Wishkah River and major streets downtown make an appearance in the movie’s official trailer. A lot of interior scenes were filmed in and around Seattle. That’s dictated in part by the project’s limited budget, forcing the production staff to film interior scenes at locations where Van Til, a Seattle native, knew the property owners. The costume budget didn’t allow for buying football uniforms that mirrored the blue and gold of the Aberdeen Bobcats. And the crew had to shoot the football scenes at King’s High School in Seattle since they were able to film there at no charge. Van Til didn’t want to sacrifice authenticity by having his football team take the field in red and white, but after talking it over with film producer Sophia Hoefle, they decided it could be a good thing after all. Van Til’s first feature-length film is tentatively set to be released next spring. Isabel Bennett plays Mia, a young sports journalist from Aberdeen looking to make a splash in the news industry. When she uncovers controversy surrounding the high school’s football team, she has to weigh the potential negative impact that comes with writing hard-hitting pieces. Trying to capture the struggle of a small town journalist was relatively easy, but getting some of the rainy weather associated with the area proved to be a bit more difficult. Hoefle said the weather was disappointingly nice when the crew brought their cameras to Aberdeen in April. The movie comes with a heavy dose of realism, including opioid use. Van Til drew from some of his own life experiences when writing the script. He played basketball and baseball in high school, and tried to draw on the pressures he felt as a high school athlete when depicting the football players in the film. He also mentioned that hanging out with his brother, who used to write for the Lynden Tribune and currently works for The Herald in Everett, helped him see the impact a sports reporter can have on people’s relationship with the school in a small town. With Van Til still attending class at Loyola Marymount University and looking to establish himself in the world of film, his own resources were limited. When the crew works through some of the final stages of post-production, including editing the sound and adjusting the film’s color, the next step will be submitting the movie to various film festivals. Since most film festivals won’t accept submissions of films that have already premiered elsewhere, no concrete release date has been set. With Van Til hoping to get the film screened at festivals like Sundance, the director is eager for audiences to see his work. Hoefle also is excited to show that college filmmakers can put together a polished project. Courtesy photo Director Colton Van Til, right, talks with lead actress Isabel Bennett while setting up a scene. 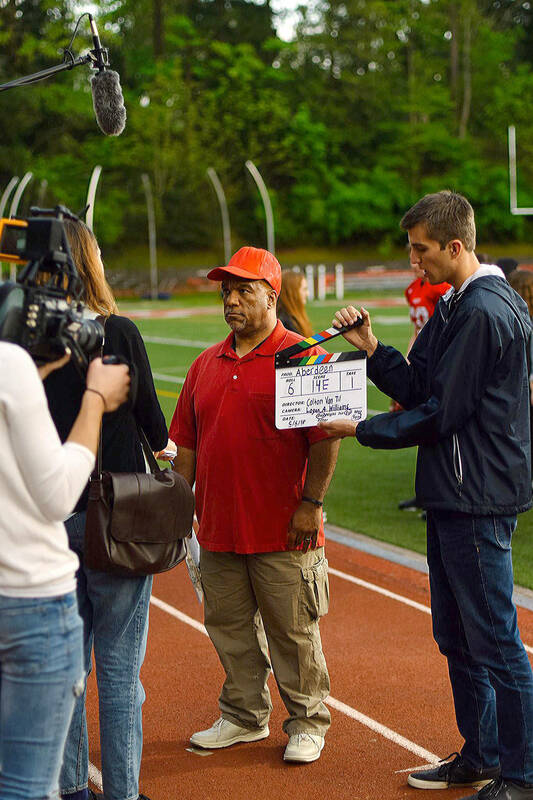 Courtesy photo Tommy Driver, who plays Aberdeen’s football coach in the film, prepares to shoot a scene at King’s High School in Seattle.